Of the thousands of icons you can find online, social network icons would have to be among the most numerous. This is hardly surprising, considering the amount of time people dedicate to social sites and the rewards they offer when your users share your content to these networks. Because of this, you can only benefit, if you add social icons on your site or on the sites you design for clients. In the previous article in the series, I focused entirely on flat icons. However I found so many attractive 'non-flat' social icons I decided to broaden my criteria with this piece. There is also no doubt that vector icons are more useful because of all the flexibility they offer – and the rise of SVG adoption – and I set out to avoid raster icons all together. Again, I felt this would have been unfair as it would have excluded some of the finest examples in the category. And raster icons are still widely in use and this will hardly change in the near future. I feel a little guilty starting the list with a raster icon set but these free social PNG buttons are so pretty that they deserve the first place. The set includes 20 png icons of the popular social (and some other) sites, such as Facebook, Google, Google Plus, Gowalla, Vimeo, YouTube, etc. The buttons are free to use in both personal and commercial projects and they do not require attribution. This is another free raster pack of social icons. What makes them special is that they are circle social icons and that there are 270+ icons in the pack. The icons come in multiple sizes, such as 512×512, 256×256, 128×128, 64×64, and 48×48. For just $5 you can download the PSD files, which gives you more options to modify the icons as you need. In addition to icons for the really popular social sites, such as Facebook, Pinterest, Google Plus, etc., here you will find icons of many social sites you might have not even heard about. Finally we get to a quality vector pack of social icons for you to enjoy. This pack contains 85 flat minimalistic icons in vector and png format. To be precise, there are 340 icons because each of the 85 original ones comes in 4 styles – square, knock-out square, circle, and knock-out circle. The pack has been recently updated, so it contains icons of all the social sites that are popular right now. Here is one more vector icon pack but this time it's a 3D vector pack. The icons are really nice but unlike some of the other packs that come with hundreds of icons, this one has only 10 icons – of the really important social sites only. In addition to the AI files that give you freedom to tweak the icons as you like, the pack contains a 256×256 PNG version as well you can use right away. Most of the packs so far were colorful ones but if you don't need all these colors, here is a black and white pack of flat social icons. The icons are very basic with no frills but there are 700+ of them. Each of the popular social sites has multiple icon variations. Additionally, since it's a vector pack (in SVG and EPS formats), you can not only add color, gradients, or any other effect to the icons but you can also add more detail, if necessary. Let's continue with some more flat icons. This pack contains only 15 icons but they have some cool effects, such as long shadows (very typical for flat design) you can't find elsewhere. The icons might not be numerous but they cover the essential social sites. What is more, on the same page there are 35 more flat social icons. The icons are free to download and use but in order to get the download link subscription required . In case you need more circle social vector icons, you might want to check this pack. The pack is a little more dated than the others and it contains some icons that are not as popular now (such as Digg) and lacks icons of newcomers such as Pinterest. Regardless, I think these icons are so crisp and versatile that it would be worth creating any extra icons you might need. There are only 12 icons in the pack but they are nice and clean ones. There is a free and paid version, so you'd better check what's included in each one before you proceed to download and use. Social media might be a newer concept but if you are looking for a more vintage aesthetic, then you will probably appreciate this pack of flat vintage social media icons. There are 32 icons of the most popular social sites, such as Behance, Blogger, Pinterest, Instagram, Facebook, WordPress, etc. in ICO, ICNS, and PNG formats in multiple sizes. Here are some more vector icons for you to enjoy. This pack of glossy social icons contains just the basic icons of services, such as Facebook, Twitter, Google Plus, YouTube, or Pinterest but each icon comes with a lot of detail. As for shape, they are rounded squares. This set of sleek social icons is really beautiful but unfortunately it doesn't come in a vector format. There are 25 icons in 32×32 and 16×16 size, which might work in many cases but if you want to enlarge and/or modify the icons, without the source files you won't be able to do a lot. Nevertheless, if you are comfortable with the limitations, this icon set is a really beautiful one and you will probably find how to put it to good use. This pack of modern social media icons contains 28 icons, most of which can be found in other packs as well but there are some icons of sites that are not so easy to find elsewhere. The icons come in ICO and PNG formats. What's special about this pack is that in addition to the version with round corners, the same icons are available as squares and circles. Note: These icons are free for non-commercial use only. While I do appreciate a good raster pack, vectors are vectors and they have many advantages. This is why I appreciate even more a good vector pack, especially when it has 100+ icons one can use for free in both personal and commercial projects, as is the case with this vector pack. With its 110 icons, chances are you will find what you need, even if it isn't a major social site. The icons are clean and bright and since they are vectors, you can edit them as you need. Some of the previous icon sets contained circle, square, rounded corner square and what not other shapes but this one comes with polygon icons. To be precise, the same icons are available as rounded squares as well but since we already have these, I'd emphasize the polygon shape. As you might expect with a pack of 80 icons, almost any popular and not so popular social site can be found inside. The last item on this list is a little different because this doesn’t represent a series of social sites. 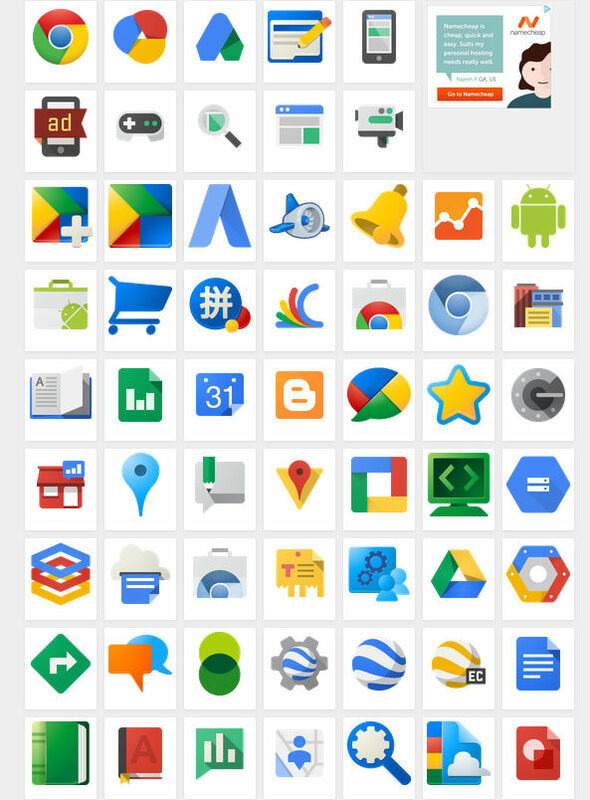 Rather, this is a pack of icons of various Google products, some of which are social but most of them aren't. To be honest, I haven't even heard of a dozen or so of the Google products listed here, but the doesn't necessarily mean these aren't popular services with millions of users. Whatever the case, if you need a Google product icon, you’ll find it here. The icons are very pretty and if only they were vectors, it would be a slam dunk. Nevertheless, the choice of 128×128 pixel PNG or GIF should be useful enough for most of us. While I do not claim this is the definitive list on social icons, I do think it does have resources for almost any taste and need. If you are lucky, the icons in these sets might be perfect for you as is but even if you have to make minor modifications to them in order to meet your requirements, this is still much faster than designing them from scratch.